Avianca Brasil Avianca Brazil, officially Oceanair Linhas Aéreas S/A, is a Brazilian airline based in São Paulo, Brazil. It operates passenger services from 25 destinations. 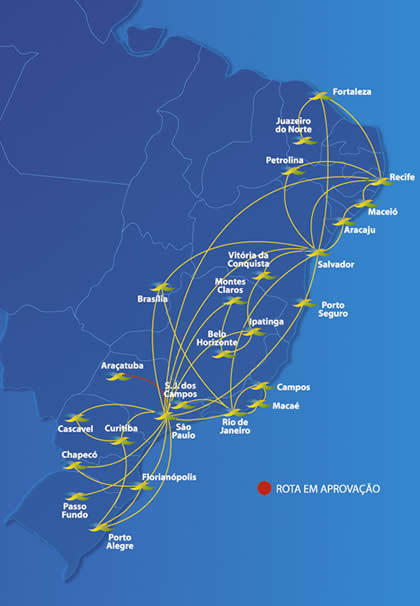 Its main bases are Brasília International Airport and São Paulo-Guarulhos International Airport. According to the National Civil Aviation Agency of Brazil (ANAC), between January and December 2018 Avianca Brazil had 13.4% of the domestic and 7.3% of the international market shares in terms of passengers per kilometer flown, making it the fourth-largest airline both in domestic and international traffic in Brazil.